• High abrasive stability. 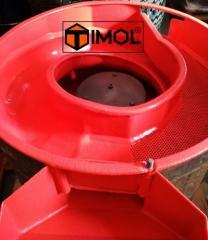 Thanks to this property polyurethane became known in equipment. Products from polyurethane are up to 50 times more long-lasting than rubbers, plastics, in some applications - non-ferrous and ferrous metals. This durability often means that polyurethane details can be made with amount of material, smaller on weight, demand less costs of service, creating as a result considerable economy of means. • High tearing strength and resistance to distribution of cuts, resistance to influence of the cutting blows. Products from polyurethane keep form and mechanical characteristics after the appendix of cyclic loadings. • High elasticity. Products from polyurethane well resist to flexing without destruction. 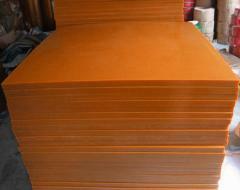 High durability of polyurethane allows to use them in thin coats for increase of elasticity in dynamic applications. • Friction coefficient. Polyurethane can be made with friction coefficient from very low, like plugs, bearings or wear bushing, to very high, like tires or shaft. Natural lubricating property of polyurethane allows their use with other moving parts without greasings. • Temperature range of operation of products from-50 to +80ºС, it is short-term to +100ºС. Polyurethane remains flexible at very low temperatures and has the outstanding resistance to thermal shock. • High elasticity and elasticity with the broad range of hardness, resistance to repeated strains and bends without break. Lengthening to 650%. • Low residual deformation when unloading. Polyurethane has high permissible load on shift. • Good adhesion to the majority of materials. Possibility of production of the reinforced details. • Good chemical resistance to oils, oil, organic solvents. • Fine resistance to adverse atmospheric actions - to moisture, ozone, ultra-violet radiation, microorganisms, the combined influence of friction and corrosion environments. • Use of polyurethane allows to reduce product weight to 50%, to reduce the level of vibrations and system noise of the working mechanisms in comparison with metals. • The majority of polyurethane - excellent electric insulators. Unbelievable price on Product polyurethane from polyurethane of any kinds, the sizes, forms. Under the order in Dnipro (Ukraine) company Timol, OOO (Zavod Poliuretanovyh Izdelij).